The charming interiors of The Rolling Pin’s outlet, near my office, had me wanting to enter this place for quite sometime. I finally did, at the less than a couple of months old outlet in Lower Parel, right opposite Phoenix Mills. 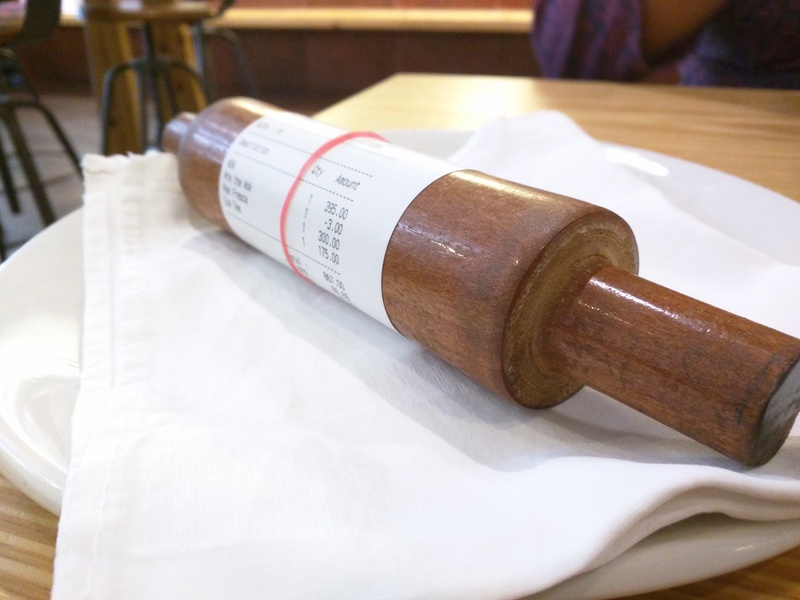 The quirky-yet-warm interiors, the open kitchen, the bakery-ish aroma and the variety of breads, pastries and other yummy savory items on display would immediately make you want for more. Already. The outlet is divided into two parts, but I insist on believing that its divided into three awesome parts. 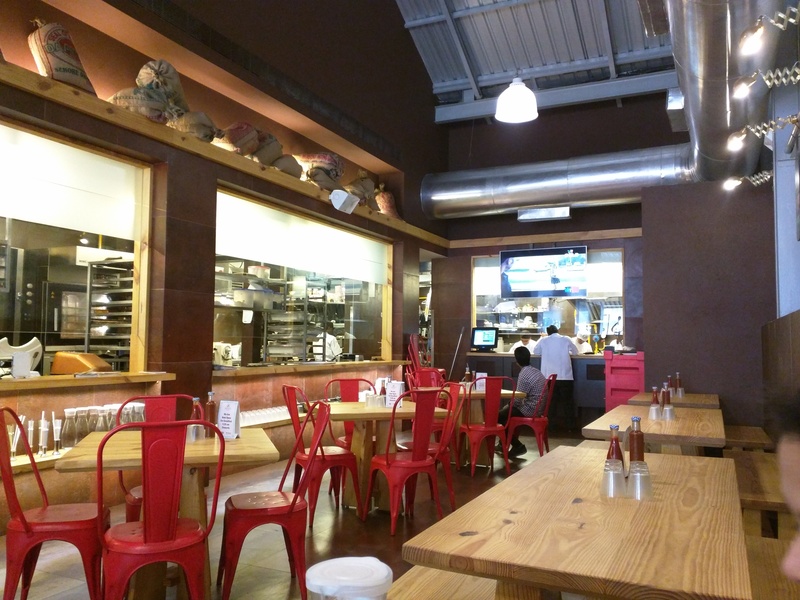 The big-long open kitchen can definitely not be ignored, the other two being the Boulangerie and the Cafe side. I went here on a gloomy Wednesday afternoon to cheer up my team over a team lunch. We got our table immediately, but I’m told that during the weekends its packed like any other restaurants. I must mention, the staff of this place are really courteous. They made us feel comfortable immediately and within no time served water and presented the menu, all with a smile and greetings. 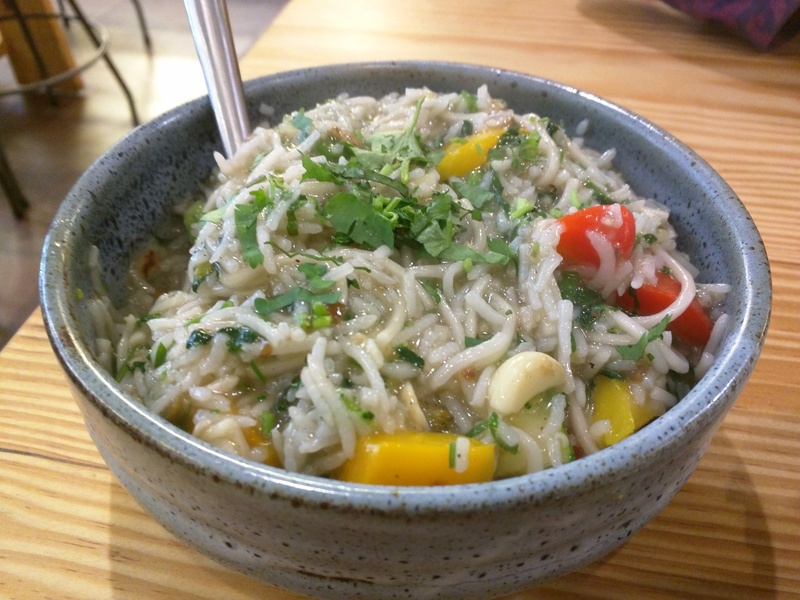 The menu is vast and boasts of quick bites like sandwiches, bagels, waffles, burgers, in addition to pizzas, Asian woks and a range of baked items. Such a bummer that the place only serves ‘pure vegetarian’ food. I recommend either reading the description under each dish, or just experiment with what you want to eat. I say this because the servers haven’t yet got the hang of the menu, and are clueless if you ask them for recommendations. The cafe also has some tempting range of ice-teas. The Thai ice-tea caught our eye first, but when the server described it to be coconut milk based, we thought against it. We started off with the Orange & Berry Ice-tea. The drink was very mild on flavors, not very sweet and with berry pieces. 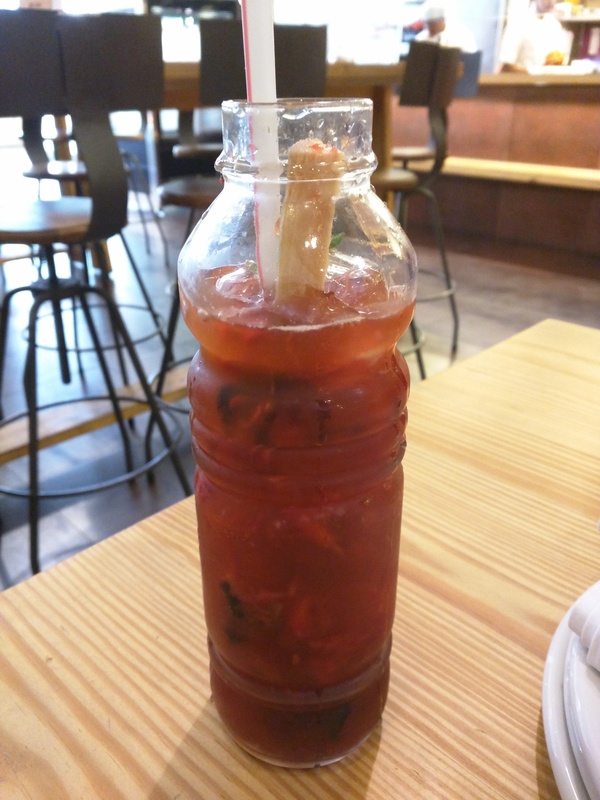 Served in this attractive glass bottle, the drink reminded me of Candies’ Wild Berry Ice Tea. This was definitely a refreshing start to our meal. Next on our table was the Pan Fresca Pizza. 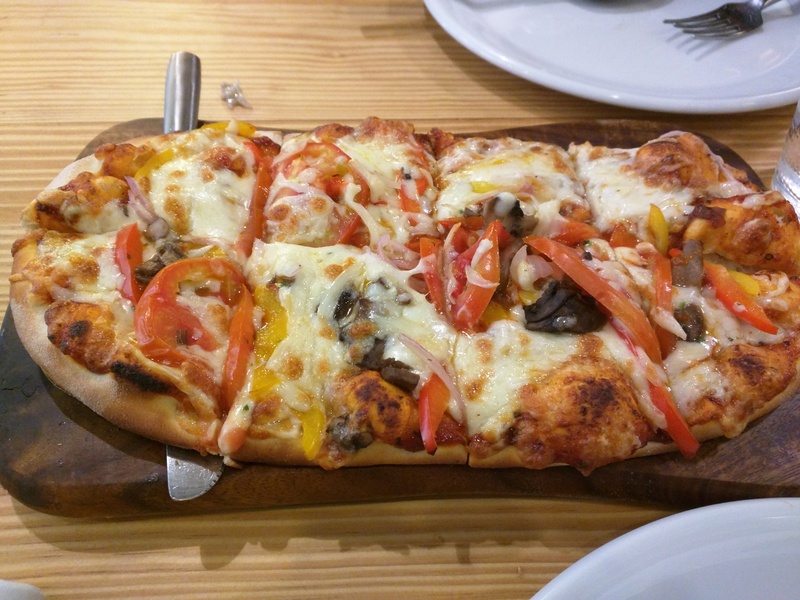 Loaded with veggies, mushroom and cheese, the pizza was delightful and made us want for more. Though I felt that the size of the pizza was a bummer. If you’ve followed my posts or know me personally, you would know my love for Chinese cuisine. Well, how could this meal end without a Chinese dish. Next up was the Asian Wok. The fun part here is that you can select the veggies (any 6), rice/noodles and the sauce. I really like this kind of arrangement, as it gives you the feel of making your own dish and you get to exclude what u don’t like. We ordered for a wok with a mix of veggies, rice, noodles and chilli garlic sauce. The dish was heavenly, with right flavours hitting the right flavors, not too spicy and veggies rightly cooked. For me, the Asian Wok was clearly the star of the meal until our dessert was served. 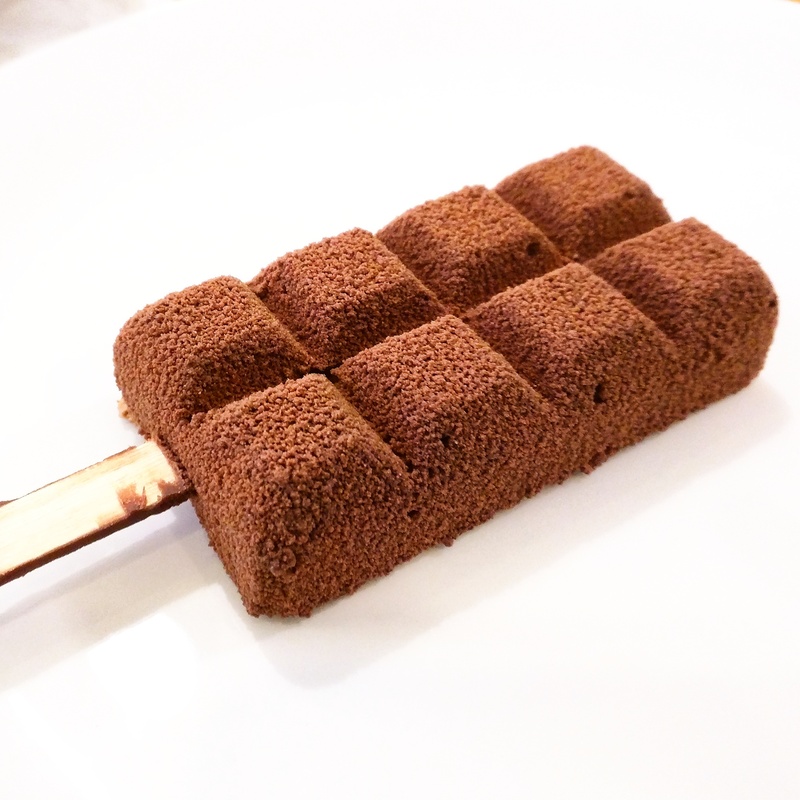 We ordered for the gorgeous looking Chocolate Mousse Bar. The soft chocolate mousse inside this cocoa powder sprinkled bar was just perfect. Wait! Hasn’t the picture melted your heart already? We spent around Rs. 1500 for this meal. All in all, if you have the sweet tooth and love eating in cozy environments, this is the place you must try! For me, despite a few minor bumps, the overall experience inspires an encore, and soon. At: Janta Industrial Estate, opposite High Street Phoenix, Lower Parel. ← India Food Trends 2015: What will keep you hungry for more?